Kaplan took the 15 color photographs in the show on the Cape, but they certainly don’t look like what people think of when they think of Cape Cod. This is an uncrowded, off-season, even wintry place. The images show ice floes, dirty windows, a snowy deck, a tossed-out mattress, a spilled ice cream cone — worse than that, a spilled ice cream cone in an empty parking lot. As those words in the title “not” and “vacation” might indicate, incongruity is king. But is the incongruity more comic or desolate? And bear in mind that incongruity is a function of expectations. Take away any preconceptions about the Cape, and these photographs start to look a bit different. They’re about what just as much as where. 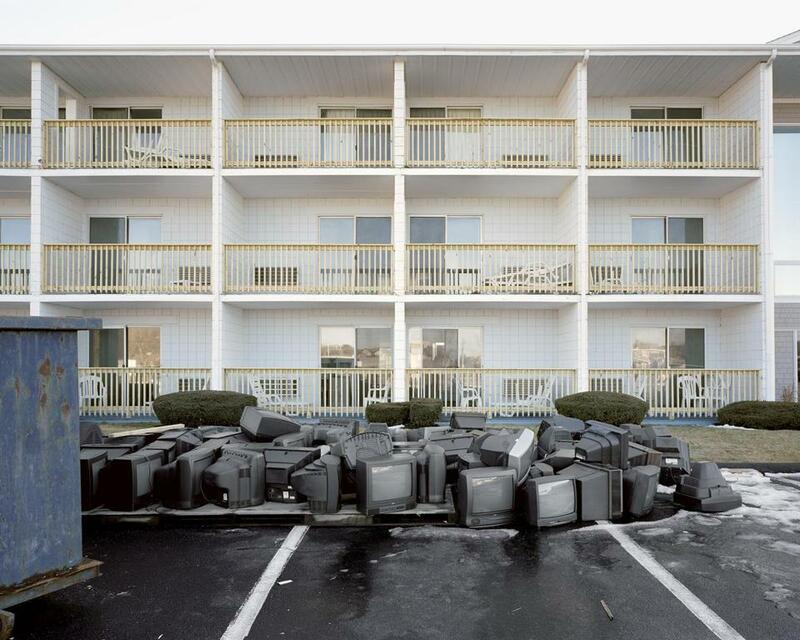 The piled-up televisions (also in a parking lot) in “Sandcastle Resort” are what catch the eye. But notice how the image is as much about the play of parallel lines. The purity of geometry counters — or encases — the jumble of objects. And all 15 photographs have that remarkable Cape light. That’s one thing that’s never out of season. Sarah Pollman’s “Aura/Ground” is binary. The photographs, all of which are color, come in two groups: five of gravestones, eight of moody nocturnal scenes. There’s nothing morbid about the former. The gravestones are as much sculptural as funerary, and handsomely so. These photographs are themselves binary, evoking past/present, death/life, hard/soft. Pollman juxtaposes the stones, which she shoots head on, with the softness of surrounding elements: leaf, grass, snow. The night scenes are binary too: partly in focus and partly out. This adds to their sense of mystery. In “Staircase,” a man stands on a set of impressive-looking steps. Is he coming or going? Is the building a museum? City Hall? Library? In “Tree,” branches dominate the foreground. A small human figure stands in the distance, brightly illuminated but out of focus. The artificial light jumps out from the black background. It’s a reminder of the binary relationship that underlies all photographs, between light and darkness, here exaggerated to startling effect. The title of the Japanese photographer Rinko Kawauchi’s show “Ametsuchi,” one of two that Lesley University is currently mounting of her work, suggests the extent of her ambition. A rough translation would be “song of the universe.” Both shows run through Oct. 30. That’s a tall order, not to mention a mite abstract. That Kawauchi succeeds, and rather spectacularly, is owing to her reliance on specificity. God, it has been said, is in the detail. So is wonder — or at least the communicable kind is. Kawauchi photographs controlled-fire burning in Japan. The images are at once straightforward and confounding. Blackened soil and empty sky share the frame with swirls and gouts of orange flame. The economist Joseph Schumpeter famously described the functioning of capitalism as “creative destruction.” What Kawauchi shows might be described in a no less paradoxical fashion. It’s meditative destruction. The other Lesley show, “Illuminance,” is scattered and vague, as “Ametsuchi” is not. Vatic, not vague, is the effect Kawauchi is striving for. These 36 photographs — eight large, 28 small — show a variety of subjects: a lighted candle, a dead deer, the moon, a hand tying thread, a flock of pigeons. Presumably, there is there some higher unity to be found in such multiplicity. As to what that unity might be — beats me.